Turn my butterflied harissa lamb and white bean puree into a simple salad. 1. Gently simmer the quinoa in the stock in a medium-sized saucepan for 12 minutes. Remove from the heat, cover and leave for 10 minutes to steam and fluff up. Allow to cool before adding to a large serving bowl with the salad leaves, red onion and herbs. Toss to combine. 2. 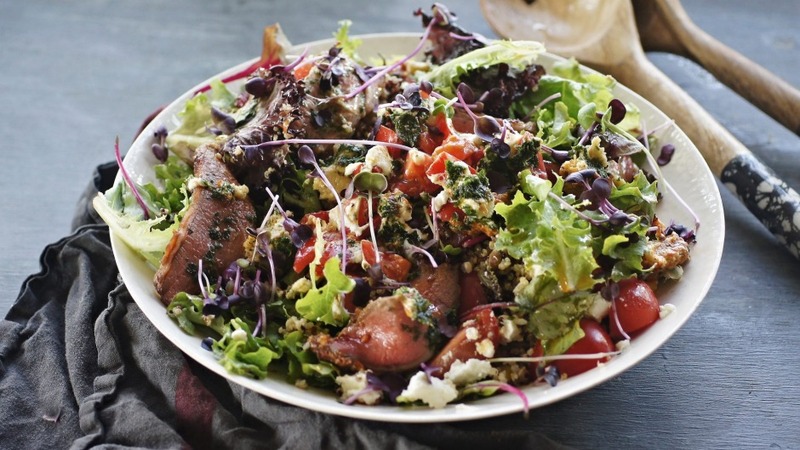 Dollop any leftover white bean puree through the salad, then top with sliced lamb, cherry tomatoes and feta. 3. Combine the dressing ingredients in a small bowl, and pour over the salad (if you have any leftover gremolata from the butterflied lamb, pour this over, too). Toss gently to combine, scatter over microherbs (if using), season with salt and pepper and serve.